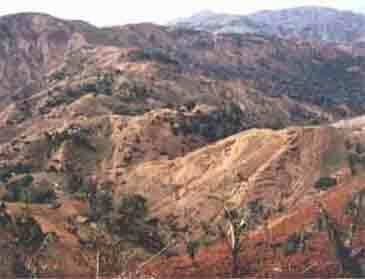 The slash and burn farming that Inga alley cropping is designed to replace is a form of shifting agriculture where the natural vegetation is cut down and burned to clear the land for cultivation. Unfortunately rainforest soil looses its fertility in as little as a year or two when the tree cover is removed. So the farmer moves to a new fresh plot and does the same again, repeatedly. In earlier times when the population density was much smaller, slash and burn worked reasonably well. It was then possible to leave the plots fallow for 15 to 20 years which allowed considerable regrowth of the forest and good restoration of soil fertility. But even when it was possible to grow enough food reasonably easily with this system the farmers still remained relatively poor. Slash and burn near FunaVid, Honduras. Photo Rick Seal 2011. Now either the forest keeps being cleared, making slash and burn still the a major cause of deforestation, or the plots have to be reused too soon, with increasing loss of fertility.